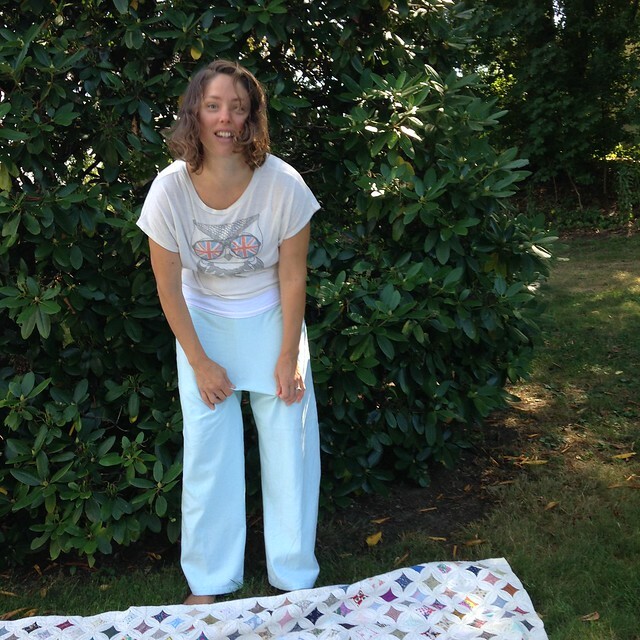 Blogger Lisa Poblenz failed in her recent attempt to create pajama pants. 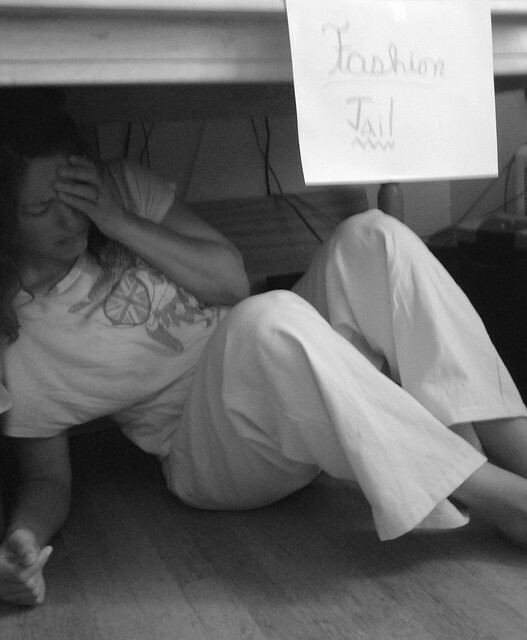 This failure landed her in fashion jail, a dark recess policed by her daughter. “These pants are a hot mess,” reported fashion guru Tim Gunn (Just kidding–Tim Gunn doesn’t know Lisa Poblenz…but if he did, that is what he would say.). 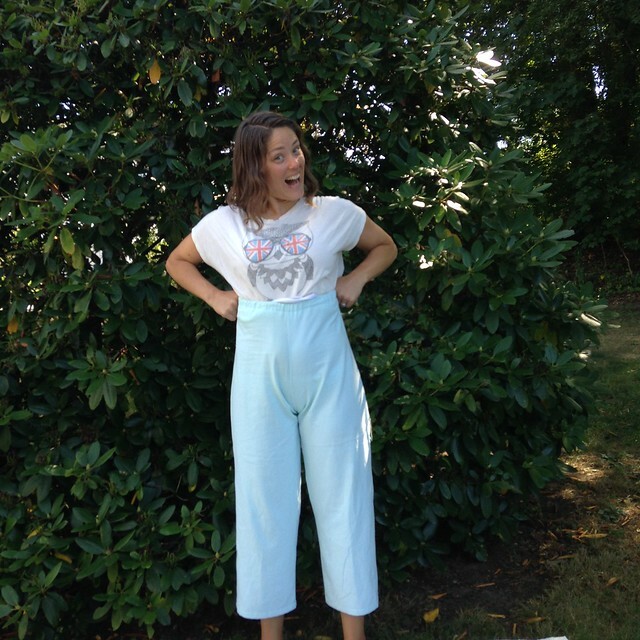 For those who love to wear their pajama pants at their natural waist, this pattern could be a winner. It’s also quite long, which is nice for the very tall among us, as it can be hemmed to the desired length. For all those out there who love to wear their pants a bit lower, however, it may be a match made on The Planet of the Apes. In fact, this garment has not even survived to the point of this writing. It has already been cut up and put into service as scrap fabric so that Lisa could teach herself how to sew exposed zippers. Maybe that will throw the fashion police off her trail long enough for her to right the ship and try again. My husband has a friend whose son is in a chess club. In the club, they tell the students that “there’s winning, and there’s learning”. Losing somehow got left off the list. When we heard that, we laughed, chalking it up to some sort of self-esteem gimmick intended to keep kids from ever feeling bad about themselves. But then, as sometimes happens, I started to think about the concept. So now I get to laugh at myself for being so cocky because, in certain areas of life, that principle holds true. In fact, in sewing as in chess, the only real losing happens if you fail and learn nothing from it. 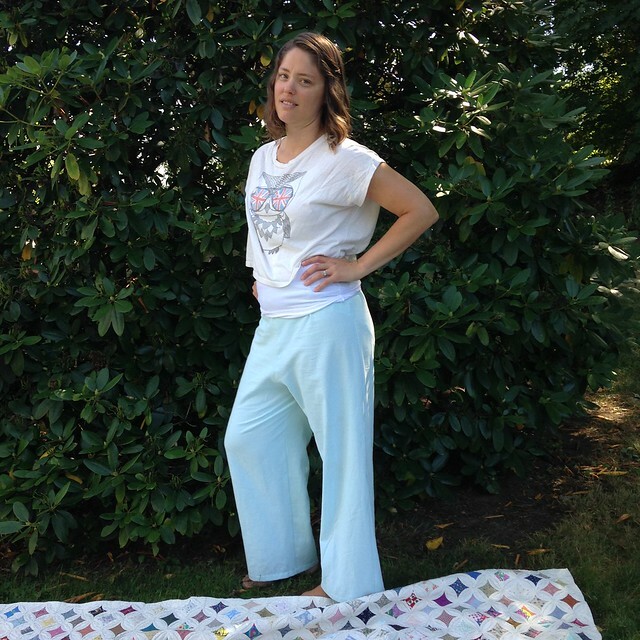 So, today, I have a few sewing failures learning experiences to share with you. 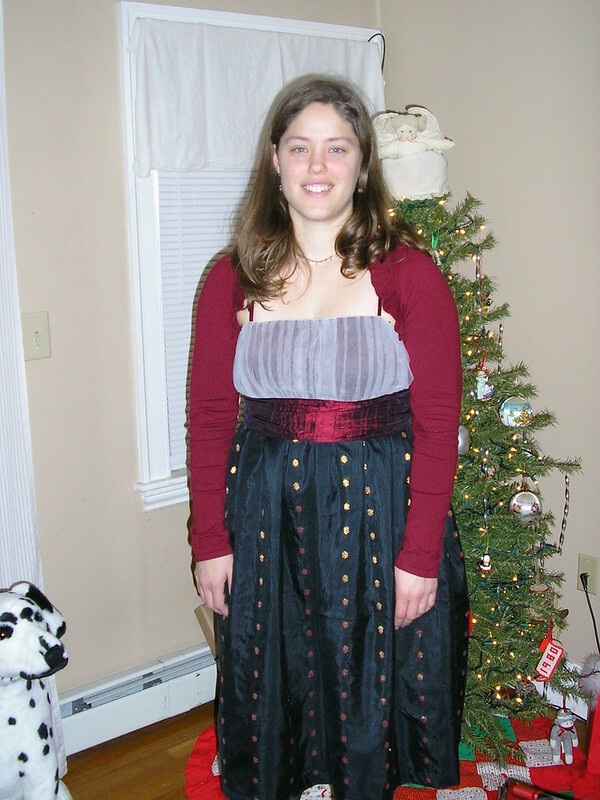 These are garments I completed awhile ago, but in wearing them I discovered that they weren’t really right somehow. This summer and last made me see that I really wasn’t wearing this shirt. I like the concept of it, and I love the fabric and the binding I (finally) managed to get attached, but when I wear this, I’m always worried that it will blow open in the back. I also can’t wear standard undergarments with it without worrying about my straps showing (something I’m not a fan of, despite current trends). The shirt never lays right (which I think is due more to my fiddling with the seam allowances and binding than with the drafting of the pattern). So, I declare this a fail learning experience. What I learned: It’s better to spend my time making a bunch of shirts I can wear with standard undergarments rather than making ones that will cause me to worry if anything I don’t want to show is showing. Maybe five normal shirts equal one that calls for strapless support. I also began learning to use my binding attachment on my Featherweight, something I had never tried before. I thought I was so smart when I made this. Rather than following the pattern lengths given in the tutorial, I used as much fabric as I had because I loved it so much and didn’t want any to go to waste. And then I never wore it. Because it was too long/big (actually, this picture brings the word “goiter” to mind). Now the former scarf is on my sewing table, recut into a woven tank top. Hopefully that will work out better. What I learned: Sometimes it pays to follow the directions, even if it means a little bit of “waste”. Because, really, couldn’t I have used the leftovers for something else and then had a useable scarf? Also, even though I could have reworked the scarf to a shorter length, sometimes you are just done with a project and need to move on. And that’s ok.
Well, some of you knew this was coming! My latest attempt at a swimsuit gets an A for looks, but is a fail for wearability. I wore this suit once while in Michigan and, in addition to the issues I detail in the (very detailed) post about this suit, one of the underwires started to come out. That was when I decided: I’M DONE! Then I promptly bought a too-big tankini top from a thrift store and started fiddling with that, trying to get it to fit. Sometimes, it can be hard to know when you need to walk away. What I learned: Know when to walk away! I’ve put myself on bathing suit probation for a few months. I’m still determined to get “mad bathing suit sewing skillz”, but I need to take a break before diving in again. Also, there may be something to be learned in the realm of not trying to make a pattern do something it wasn’t intended to do…but you can’t always know until you try. Maybe that’s the larger lesson to be learned from each of these projects: TRY. If there’s no “losing”, if you can learn from it, it’s probably worth it to try. Of course I’m not talking about “trying” stuff with massively expensive fabrics on someone’s wedding dress or something. The stakes were never even close to that high with any of these projects. But I’m glad I did them, even if they aren’t going to become part of my wardrobe, because now I’m a better seamstress/sewist than I was before. It’s been awhile since we had a Craft Fail, hasn’t it? Either my creative skills are exceptionally fabulous, or I’m just working harder to fix my mistakes. I guess I should quit projects more often so we can keep the Craft Fail section going strong. 😉 OK, I’m not going to do that. It’s too satisfying to turn a failure into a success, but some things are just unsalvageable. That’s the direction my last cooking experiment went. I was going to meet some women to discuss a book, the Bible, and life, so I thought I would bring a snack. I have the More-with-Less cookbook by Doris Janzen Longacre, a Mennonite cookbook that my Mom used when I was growing up. I found this recipe in the snacks section and, since I had some wheat berries around, and no other snack ideas, it seemed like a perfect match. The recipe said the wheat would puff up after a bit so, even though I didn’t really know what I was looking for, I kept checking it…and it had a sort of interesting smell…and it got a little darker…and the smell got stronger…and the wheat turned black. Oops. There was no saving this one. I preserved it in photograph form for your enjoyment, and cut up some apples before heading out the door. Well, you may not believe it (I can hardly believe it myself. ), but I found new drive to finish all those projects I was procrastinating on. I’m excited to show you. Now this first one is borderline “Craft Fail”: The Swimsuit. The nice thing is, it looks great on the hanger. Now, maybe you will (immediately) notice something I did not. I was so enamored with the chevron design that I only focused on lining the points up with the middle of the suit. I was so proud of myself! Now my husband noticed what you may be laughing about right now, but he knows that it annoys me when he trouble-shoots my projects, so he wisely stayed silent until I tried my finished suit on and saw it for myself. In case you haven’t noticed, think about how the points of a chevron design could, possibly, act as arrows…Do YOU want arrows indicating your most private areas? I certainly don’t! Despite this feeling on my part, it seems I managed to point arrows at both my upper and lower private areas. Oops. That’s awkward. I also realized partway through that although I thought I was sewing View C on my pattern, which has a built-in shelf bra, I had actually been sewing View A (even though I cut out View C), and had left the shelf bra out. Oops. See that extra piece on the left? Yep. Forgot it. But, you know, I figured I could just skip it because there is that other view without it, so whatever. Moving on. At that point, I made the decision to carry on and just finish the suit and hope for something wearable. I knew I could rip it out, and I also knew that if I did, it would cause a mental block and I would never finish this suit or make another one again, so I had to push through. I ran into a few quality issues, but I decided to ignore them. Here is my contrast edge with a few wrinkles. Still a cool concept though, don’t you think? I found the instructions for the contrast elastic edging on Kadiddlehopper’s 2013 Swimalong. So, I finally finished, and was hoping for something wearable. (Sorry, but you aren’t getting a picture of the finished project. I don’t feel embarrassed by how it looks, but there is something about modeling a bathing suit on the internet that doesn’t appeal to me.) It looked ok when I put it on, although the fabric was a little thinner than I would have liked. That’s when I saw the “arrows” on the suit and also realized that it wasn’t squishing me because it was actually a bit too loose. I had followed the measurements on the pattern, but either I had picked the wrong fabric (very possible) or they don’t have enough negative ease built into the pattern. It’s really had to tell what is operator-error or pattern-error here. Most/all is probably operator-error since this was my first attempt. Will I wear this in public? No. But am I glad I made it? Yes. Now the question is: Should I buy more fabric and try again since I could probably get through it quickly now that I’ve done it once, or will I still get a mediocre suit because the pattern is not awesome? I don’t have the experience to know. What do you think? Now for the other two projects, the shirt and the dress. Rather than getting fancy with them, despite how cool it could have been, I could tell that if I didn’t finish them soon, they would enter that perpetual work-in-progress zone and never be done, so I decided to call them finished with only the contrast binding on the neck and shoulders. I did have to go back and do a small zigzag stitch right on the edges because the wide zigzag I did in the middle of the binding didn’t reach far enough out to tack the edges of the binding down, and it kept rolling up. Maybe you can just see it below. Both of these patterns are my machine-sewn version of some of the basics in Alabama Studio Sewing + Design by Natalie Chanin. I love the look of the hand-sewn garments (especially the embellished ones) in her books, but when I want a quick project with a great silhouette, I sew the basic patterns on my machine (plus, you can use old t-shirts or knit sheets for fabric). 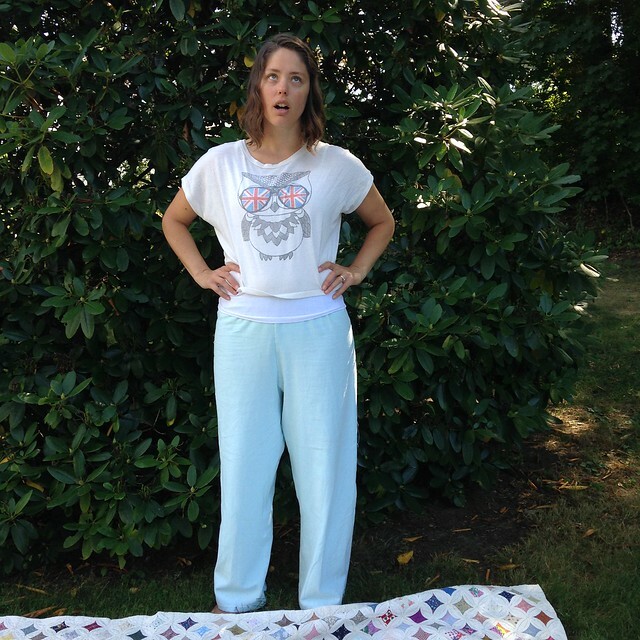 I’ve worn the shirt, and I like it, although I will give you one thing to be aware of if you sew with knits sheets. Sometimes (ok, every time I’ve used them) the grain is off. I don’t often notice it in the finished garment, but I feel like this shirt pulls slightly to one side. It’s subtle. I’m the only one who will notice, but I haven’t yet started to obsess about fabric grain. If you do–then buyer beware! The good news is that knit is really forgiving and I never find any of that to be a problem after a few wears. The dress fabric is pretty thin, so it shows curves and bumps more than I would like (as opposed to skimming over them), but I’m going to try some of the layering techniques in the Alabama Chanin books and see what I come up with. I think it will be cool in the end. Wow. If you hung in there through this super-long post, way to go! Before we go, I want to tell you that I’m keeping my eyes open for a day to take you along clamming (virtually). This has been a terrible clamming summer with lots of clam-bed closures for a late red-tide bloom (I feel knowledgeable saying that, even though I just learned about it.) and due to rainfall. (I can explain that more another time.) I tried to go last week to do a little “catch and release” clamming, but didn’t find any. I’ll try again, though, and try to document it all for you so you can come along via the blog. In the spirit of sharing, honesty, openness, and just laughing at our own mistakes, let me introduce Craft Fails. Sometimes you have a great creative project going, and it just tanks. You know, you just botch it. The idea is great, but something in the execution goes awry. I’ve had many projects like this. So what do you do? Sometimes you power through it, and ignore your mistakes. Sometimes you just want to cuss (yes, “cuss”, not swear or curse). But what about the real failures? Well, I think we should share those projects because shouldn’t we all laugh at ourselves once in awhile? I’m fairly open, so I don’t mind sharing my disasters with you. I hope that some of you will send in your craft fails from time to time, too. For more information on that, see the Craft Fails page. This is a picture of my wonderful and kind husband, wearing the sweater I lovingly knitted for him over a few years with yarn I bought from a farm in Vermont. It’s sized for a giant. Yes, I did a gauge (a little test swatch to see if your knitting is the same size as that of the pattern’s author). Yes, I followed the pattern. I even tried felting/fulling it (shrinking it in the washer and dryer). You can fit at least two people in there. Now, sometimes these failures make me so mad I just want to cuss but this one was so bad, we just laughed (and almost cried, in my case). It was terrible! Sometimes my husband uses it instead of a coat for sledding, so I guess it’s still useful. That leads us to Exhibit #2, ANOTHER sweater fail! 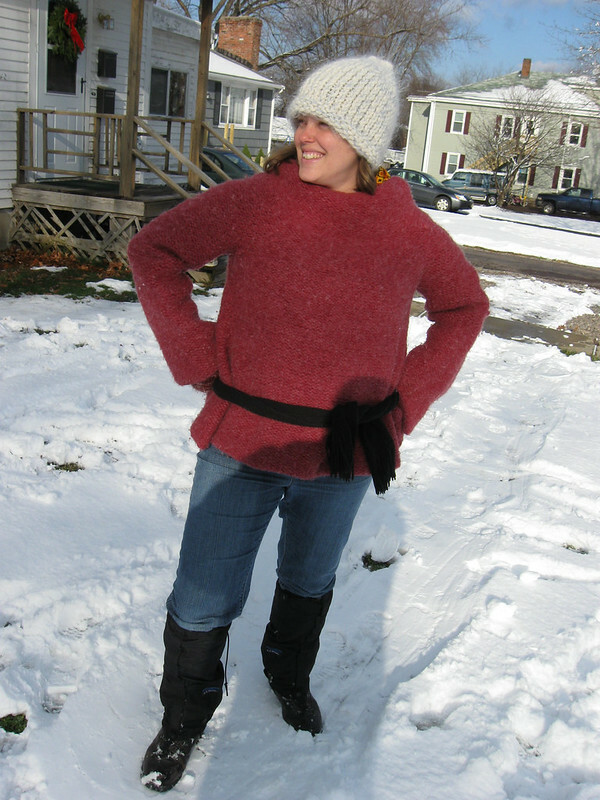 This was supposed to be an A-line chunky sweater, but it morphed into…a maternity sweater. You can see me wearing it while pregnant here. I tried to save this one by felting/fulling it also but, sadly, it didn’t help. It did keep me warm when I didn’t have a maternity coat, though. It’s all about perspective, right? (Right?) It’s ok if you laugh. I do, too, when I look at that picture. Needless to say, I’m off sweaters for the time being. I got a blast of false confidence when my first sweater fit perfectly. 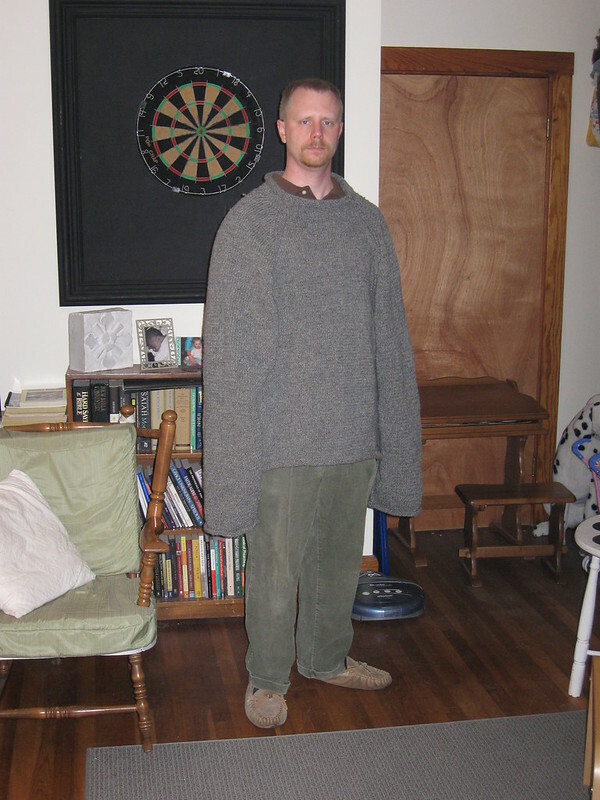 Unfortunately, every sweater since has been giant-sized. I’m sticking to hats at mittens and little things for now. Finally, what about the project you think is success, only to find out, much later, that all those looks you were getting, that you may possibly have thought were looks of admiration, may possibly have been…um…not that. Maybe people were laughing on the inside but, you know, it was on the inside, so you couldn’t see it. It was kind of them to keep it inside, wasn’t it? Flattering, no? Yeah, I thought I was so cool. Looking at the pictures a few years out, I realize this was a craft fail. Ha ha ha ha ha! Yes, I am laughing about myself as I write. Now, before I sign off, I just want to encourage you. If you, like me, have worn your craft fails in public, do not dismay. Fashion is fun, it’s experimental, and that outfit is just one day in your clothing life. A vintage jewelry vendor at Brimfield once gave me the best fashion advice I’ve received. If you like something, just wear it. Someone will probably think it’s awesome.